Transform your organization by going paperless with Sage HRMS HR Actions® by Delphia Consulting. Managers and employees can complete web-based forms spanning the entire employee lifecycle that are routed electronically for approval based on your business rules. 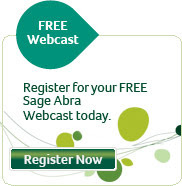 Attend this live webcast and see why with Sage HRMS HR Actions, self-service has never been easier! This one-hour live webcast will compare and contrast the benefits of a paperless human resources system with an automated compliance program. In your daily HR activities, have you ever said, "If only we had known . . . " about such things as excessive overtime, expiring certifications, or employee pay rate changes? If so, you can avoid doing so in the future by becoming a "data driven" HR organization. Attend this live webcast and learn how you can become a data-driven HR organization and provide a higher level of service to your organization. Click here to register for any of the above listed webinars or call CMS at 1-800-517-9099.